Membrane Reactors for Energy Applications and Basic Chemical Production presents a discussion of the increasing interest in membrane reactors that has emerged in recent years from both the scientific and industrial communities, in particular their usage for energy applications and basic chemical production. Part One of the text investigates membrane reactors for syngas and hydrogen production, while Part Two examines membrane reactors for other energy applications, including biodiesel and bioethanol production. 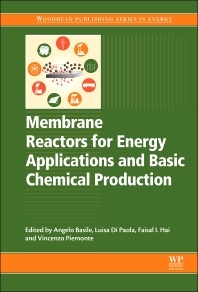 The final section of the book reviews the use of membrane reactors in basic chemical production, including discussions of the use of MRs in ammonia production and the dehydrogenation of alkanes to alkenes. R&D managers in chemical engineering companiesdeveloping membrane reactors for energy applications and basic chemical production; Postgraduates working on membrane reactors for energy applications and basic chemical production (departments of chemistry; engineering; energy). Vincenzo Piemonte is an associate professor at the University “Campus Bio-medico” of Rome (academic courses: Artificial Organs Engineering, Biorefinery Fundamentals, Chemical Engineering Principles, Bioreactors) and an Adjunct Professor at the Department of Chemical Engineering of the University “La Sapienza” of Rome (academic course: Artificial Organs Engineering). His research activity is primarily focused on the study of Transport phenomena in the artificial and bioartificial organs; new biotreatment technology platform for the elimination of toxic pollutants from water and soil; Life Cycle Assessment (LCA) of petroleum-based plastics and bio-based plastics; extraction of valuable substances (polyphenols, tannins) from natural matrices; hydrogen production by membrane reactors for water gas shift reaction; concentrated Solar Power Plant integrated with membrane steam reforming reactor for the production of hydrogen and hydro-methane. He has about 120 publications on chemical thermodynamics, kinetics, biomedical devices modeling, Bioreactors, LCA studies.